Quality isn't just some nebulous, abstract concept; it's something you can reach out and touch. When a product is high quality, you can see and feel the difference. That's why we offer a Lifetime Warranty. Read on to learn about how our materials, people and procedures work together to give you the very best quality possible. Want to see firsthand evidence of our commitment to quality? Have a free sample shipped straight to your door. Our stocks are hand-picked for their intense color, excellent scoring/folding properties and deep, distinctive patterns. They're also eco-friendly (made from post consumer recycled paper or taken from managed forests) and 95% of them are sourced directly from American mills. 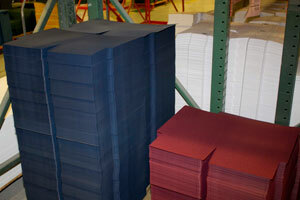 We use American-made, environmentally friendly vegetable-based inks. These provide vibrant color and crisp detail while also drying faster than soy-based inks. Every piece of artwork intended for foil stamping or embossing is carefully reviewed by our experts; we'll let you know if we think your design needs to be enlarged or adjusted for the best appearance. Our foil and emboss dies are custom-made in house, and each foil is released cleanly for a crisp and legible look. Our aqueous coatings are quick-drying, safe, water-based and recyclable. They're also highly durable and will not yellow over time. Additionally, our ultraviolet (UV) coating contain no VOCs (harmful organic chemicals), are made from 50% renewable content, and are completely recyclable. Glues are selected based on your specific product style and stock. Each folder is carefully glued using the correct bead length to prevent lifting at the corners or the pockets from coming apart. Our staff has combined decades of expertise in design and printing to give you the very best service available. Our vast experience informs us of the most common issues likely to arise with your order, so we can intercept them before they become serious problems. You're more than just a faceless order number to us. Each of our clients receives individual, one-on-one attention from people who care deeply about the quality of the products you receive. Have questions or concerns about your order? Feel free to contact us via e-mail or phone. You'll speak directly with a real person, not some automated recording. Our Print Project Team reviews your artwork to catch any potential printing or design issues. These could include missing fonts, incorrect PMS colors, embossed designs that are too thin, or other errors that might interfere with printing. Our team is also happy to provide suggestions that could improve the quality of your design. Pre-flight professionals will review your artwork again before printing begins to intercept any issues that might have fallen through the cracks, saving you time and money by preventing the need for reruns. Our proof options let both you and our design experts see a physical sample of what your printed design will look like. 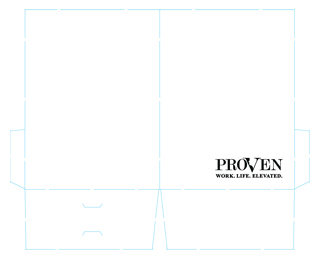 Before production of your print job begins, you will receive a free PDF proof of your printed design. This gives you the final review of your finished artwork and the chance to make any last-minute changes you deem necessary. If your design will be printed using 4-color process, you might also request a digitally printed color digital proof. The first one is free, and it lets you ensure that the colors you've chosen will meet your expectations once they're printed. Our print technicians will also use this color digital proof to catch any potential errors before printing. If your product includes a custom die cut, you may also wish to order a hand-cut mockup or product proof. Hand-cut mockups shows you a sample of a custom die cut on a sheet of blank paper. Product proofs are individual samples of your actual, final printed product (and are also useful when ordering a particularly large quantity). During each step of the folder construction process -- printing, foil stamping, embossing/debossing, cutting, and folding -- a "make-ready" copy of your product is created first. If, for whatever reason, there's an issue with the "make-ready" (such as a jagged die-cut or misaligned ink layer) then the problem will immediately be corrected before the next stage of production begins. Experts will also inspect the quality of your product at random intervals throughout each stage of construction. Before your finished product is packaged, a random sample of the quantity will be inspected one last time. Several samples will be kept in our repository so that we can inspect them later if necessary. We re-rule our dies regularly and ensure that the scoring rule for each print job is the proper width. This means that every product will always come out with smooth, crisp cuts and scores. Our proofing equipment is tested for correct nozzle operation every day, reviewed for color accuracy every week, and fully calibrated every month (along with 4-color process printers) to ensure the most precise print quality possible. We also use custom-built, high-speed folding equipment to make the process fast, smooth and accurate. While other printers may run your project at the same time as someone else's, we give your products the attention they deserve. To ensure total quality, your folder print job will run independently of any other.